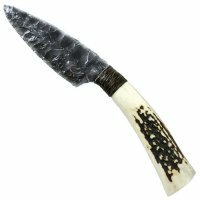 The Hokkaido-based knife maker Tokashi Suemori learned the archaic art of fracturing obsidian from the Ainu, an ancient tribe in the north of Japan. We are occasionally able to offer examples of his work, with each piece having a unique form. The price lies between €280-490 depending on the size and form of the knife.